If you’re wondering what ornithine is, why people supplement with it, and how it can benefit you, then you want to read this article. Ornithine is an amino acid that helps remove fatigue-promoting metabolites in muscles. It can help reduce fatigue in cases where ammonia is elevated like chronic stress. Ammonia can become elevated due to prolonged exercise or daily stressors, in which case ornithine may help. Which is sort of weird, right? Couldn’t we just eat enough protein and get all of those amino acids in our mouth simultaneously? Wait, hold up, an amino acid not found in protein? That, ladies and gents, is our topic today. Ornithine, a supplement we have in Pulse, that’s not actually an amino acid, and that is not incorporated into any protein in our bodies. What does this little weirdo do? Let’s dig in. Why Do People Supplement with Ornithine? What Are the Benefits of Ornithine? What’s the Clinically Effective Dose of Ornithine? What Types of Results Should I Expect with Ornithine? Does Ornithine Have Any Side Effects? What’s the Best Type of Ornithine? Ornithine is an amino acid that is not commonly used as a supplement. It is relatively unique in that it is a nonprotein amino acid; meaning that it doesn’t group up to form proteins in the body. It is technically called “L-ornithine” due to how it is structured, as amino acids can be in either a D configuration (like D-aspartic acid) or L configuration (like L-leucine). However, since there really isn’t a “D-ornithine” in supplements sometimes “ornithine” and “L-ornithine” are just used interchangeably. Instead, it works together with arginine in what is known as the urea cycle. A cyclical process where arginine and ornithine turn into each other in order to balance out urea and ammonia levels in the body. Ornithine doesn’t have many known roles beyond this, however, and isn’t thought to improve blood flow like arginine and citrulline do. The major reason that people supplement with ornithine is because it is a conditional anti-fatigue supplement and, sometimes, the conditions are just right. This anti-fatigue effect is thought to be related to ornithine’s interactions with the aforementioned urea cycle, where it can reduce ammonia levels, something known to promote fatigue in large amounts. There are also claims that ornithine supplementation can increase growth hormone secretion and sleep quality. There’s generally just one real accepted use of ornithine supplementation but, for this section, we’re going to cover a few topics that people talk about when it comes to this amino acid. Just to cover all our bases, these are the reasons people consider ornithine and whether it works well for that purpose or not. First, let’s just get the growth hormone claim out of the way since, while it isn’t false, it is mostly unsupported and may also be misguided. I say mostly unsupported because direct administration of ornithine to rats does indeed release growth hormone with at least one other study finding some benefit when taken orally in rats. However, acute spikes of growth hormone are not overly relevant when it comes to supplementation. Growth hormone is a very pulsatile hormone, increasing to a large degree at some times and minimizing at others. For appreciable muscle building and fat loss effects to be gained from growth hormone you need a better 24 hour exposure to it; not single peaks. If single peaks were enough then L-arginine, creatine, and even melatonin would all be growth hormone enhancing supplements. While ornithine has been linked to increases in growth hormone secretion, it is thought to be too short-lived to have beneficial effects to muscle gain and fat loss, much like other supplements. Unlike the interaction with growth hormone where it is more theoretical than proven, ornithine has evidence that it can reduce fatigue during exercise (to about half of what was felt during placebo) and in people who feel horrible after a night of drinking. Both of these effects are thought to be related to reducing ammonia. Now, in the urea cycle ornithine and L-arginine convert into one another with the help of a few steps and other components. The stage we are concerned with is how ornithine turns into, oddly enough, L-citrulline. Ammonia is packaged up as carbamoyl phosphate, binds to ornithine, and BOOM citrulline is the result. Under normal conditions there should always be enough ornithine in the body to keep ammonia levels at a reasonable level but, sometimes, ammonia is produced too fast for the ornithine to convert it all into more productive forms. When ammonia gets elevated it can cause oxidative damage and can impair the ability of a cell to make energy as efficiently as it did before. It can also impair the function of muscle tissue itself. This is why an increase in ammonia is associated with fatigue in exercise and, when ornithine supplementation reduces fatigue during exercise, it occurs alongside reductions in ammonia. So, it’s reasonable to assume that the reason ornithine reduces fatigue is because it reduces ammonia levels. It’s also why ornithine is used in some clinical situations, where it is administered with success to people with severe liver disorders where ammonia builds up. Ornithine binds to ammonia, turning it into less harmful and more productive metabolites, which in turn can help reduce the negative effects of excess ammonia such as fatigue. And finally, ornithine has definitely been studied in sports since it has been reported that the elevation in ammonia seen during very intense exercise may exceed that of liver disorders, and while not everybody exercises that hard; everybody has a liver. Ammonia can be increased during chronic stress related to both the liver and the brain (as ammonia can damage brain cells) which has led to studies being conducted on office workers themselves; Karōshi isn’t anything to sneeze at. Ornithine has been shown to help reduce cortisol and improve mood after alcohol exposure and just in general at the dose of 400 mg a day. Both of these studies are also interesting as they show reductions in feelings of anger which can increase when people are overworked; irritability being a known symptom of excess ammonia levels in the brain. Ornithine also seems to have the potential to improve fatigue associated with overwork, and alongside that improve mood while reducing irritability. The lowest effective dose of ornithine, for people who are not physically active, is 400 milligrams taken up to three times a day. Two grams of ornithine has shown benefits in athletes when taken daily. For acute benefits it is uncertain what the ideal dose is, studies have used anywhere between 6 grams and 12 grams to find a benefit. When it comes to using ornithine for exercise the results you should expect are actually more mental than physical. The most drastic results seen have been in the perception of fatigue itself, meaning that the exercise didn’t seem as hard as it normally was. However, improvements in endurance were less significant but still present. For non-athletes, ornithine should be able to alleviate fatigue and improve mood associated with overloaded work schedules. These benefits may not be instant but rather manifest over the course of four weeks or so. For an athlete who is also run into the ground at the office? Ornithine might be your best new buddy. Ornithine supplements aren’t known to have any side-effects. When it comes to supplements for improving your performance, ornithine isn’t at the very top of the list. That said, it is unknown if there is a best form of ornithine right now. Some supplements use the basic form, some supplements use ornithine L-aspartate, and there aren’t really any comparative studies on the topic. It also isn’t an amino acid that you will find in protein supplements or in food, since it isn’t a structural amino acid found in protein. If you want to get it in your body somehow then you either need a dedicated ornithine supplement or hope it was slipped into another supplement you take. That is a major reason why we included 2.2 grams of ornithine in PULSE. It may or may not work for you depending on your life situation but, hey, it won’t hurt and many people won’t need to seek out stand-alone ornithine supplements. 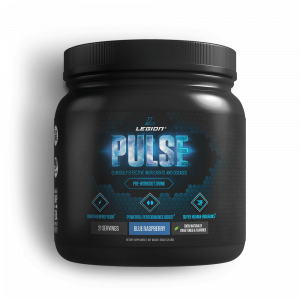 If you’re overloaded with work and need a pick-me-up before your workouts, the ornithine in PULSE may help improve your performance. Ultimately, ornithine is not the most potent supplement out there but it does seem to have an anti-fatigue effect associated with it. This anti-fatigue effect is different than something like beta-alanine or stimulants, and is something that could also be seen as healthy for many office workers. It is also the only dietary supplement currently known to reduce ammonia levels in the body and, at times, has been used to treat medical conditions due to its relative potency and safety. So if you have a busy life and feel fatigued chronically from it, if the fatigue from your training is lasting much longer between workouts than expected, or if you enjoy alcohol a little too much, then ornithine might be worth a shot. What’s your take on ornithine? Have anything else to share? Let me know in the comments below!